- "Global stock exchanges were devastated this week by the worst collapse in history as a wave of panic selling followed...a Chinese government announcement that it would no longer finance the mounting budget and trade deficits of a 'profligate United States'." - "It's been a tough year for Sino-US relations. In January, the US ambassador to the United Nations stormed out in protest over...[China's] veto to shield terrorist regimes such as Iran from diplomatic sanctions in exchange for oil. In March, China's president abruptly cancelled a state visit after the US Treasury Department branded China a 'currency manipulator.' During an unusually hot August that raised collateral fears of global warming, the US Pacific Fleet engaged in a tense, week-long standoff over Taiwan with China's [navy]." - "Meanwhile, domestic unrest in China continues to escalate... A recent report released by the US Central Intelligence Agency has warned that should such domestic unrest reach a boiling point in China, the result may be 'sharper military conflicts with the United States, Taiwan, and possibly even Japan as Chinese leaders seek to unify the now increasingly fractured nation against a 'common enemy.'" 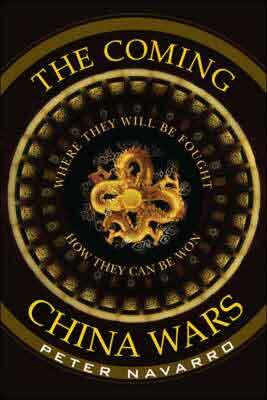 有没有EBOOK OF The Coming China Wars. I am interested in it. 哪里有? 我看看美国鬼子教授的观点.如果你要了解中国问题,这是一本好书. 如果你要了解中国,这是一本烂书.